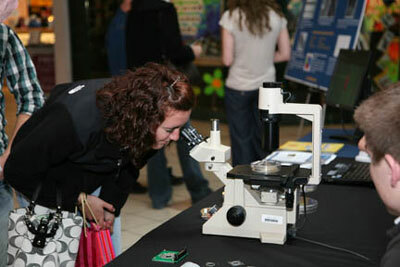 (Nanowerk News) The role of nanotechnology in improving the diagnosis and treatment of brain-related illnesses was the focus of a "Nano in the Mall" program presented by CNSE at Crossgates Mall in Albany on March 15 in conjunction with international Brain Awareness Week. The event featured interactive demonstrations, displays and detailed information regarding innovative brain research. The role of nanotechnology in improving the diagnosis and treatment of brain-related illnesses was the focus of a "Nano in the Mall" program presented by CNSE at Crossgates Mall in Albany on March 15 in conjunction with international Brain Awareness Week. The event featured interactive demonstrations, displays and detailed information regarding innovative brain research. According to the World Health Organization, neurological diseases will become the world's second-leading cause of death by the year 2040, exceeding deaths caused by cancer. While improvements in health care are allowing people to live longer, research to improve the diagnosis and treatment of neurological illnesses has not kept pace. As a result, there is a corresponding reduction in quality of life as people age due to degeneration of brain functions. Research spearheaded by Dr. Matthew Hynd, CNSE Assistant Professor of Nanobioscience, focuses on improving neural prosthetic devices, which act as a sort of "pacemaker for the brain." These devices are currently being used to treat Alzheimer's Disease, Parkinson's Disease, Epilepsy and Tourette's Syndrome, among other illnesses. Dr. Hynd's research is designed to develop advanced devices that are smaller, less invasive, more effective and more durable. Brain Awareness Week, held March 15 through 21, is an international effort organized by the Dana Alliance for Brain Initiatives to advance public awareness about the progress and benefits of brain research.